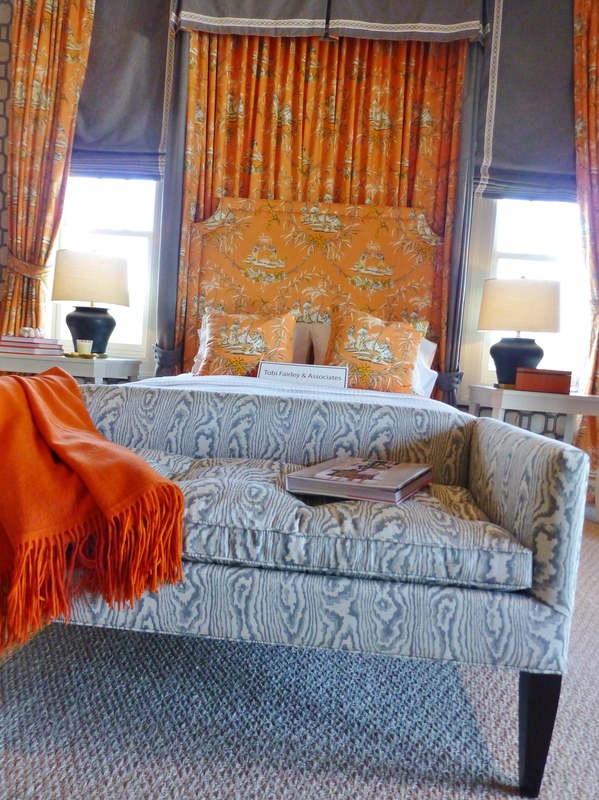 This is the view upon entering the master bedroom at the 2014 Hampton Designer Showhouse. The bed with it’s sumptuous half tester canopy is the obvious focal point (as it should be). A strong grey fabric is used on the exterior, while a bold orange toile with a tropical Asian pattern lines the canopy and covers the tall upholstered headboard. Did you notice that gorgeous Lucite lantern in the center of the room? It’s really cool…I’ve noticed from looking at Tobi’s work over the years that she’s partial to lanterns and often uses really brightly painted examples. I like that she chose a funky Lucite option for this room! Here’s a closer look at the bed wall, with it’s full length draperies in the orange toile (hung all the way to the ceiling). Tobi used grey roman shades underneath the draperies and used a beautiful tape to band the edges of both the shades and the bed hangings. The painted white side tables with their curvy legs are just perfect with the shape of those chunky charcoal lamps! The almost wall-to-wall area rug, provides a solid background and much needed relief from the heavily patterned wallpaper. This is the perfect rug for the space. To the left of the bed (on the same wall as the entry door) is a gorgeous sofa upholstered in the same grey as the window shades and bedhangings. Tobi used the same beautiful tape to trim out the seat and pillows. A large piece of abstract artwork hangs above the sofa, flanked by swing arm lamps for comfortable reading. The side tables are very small and tailored, echoing the lines of the streamlined sofa. 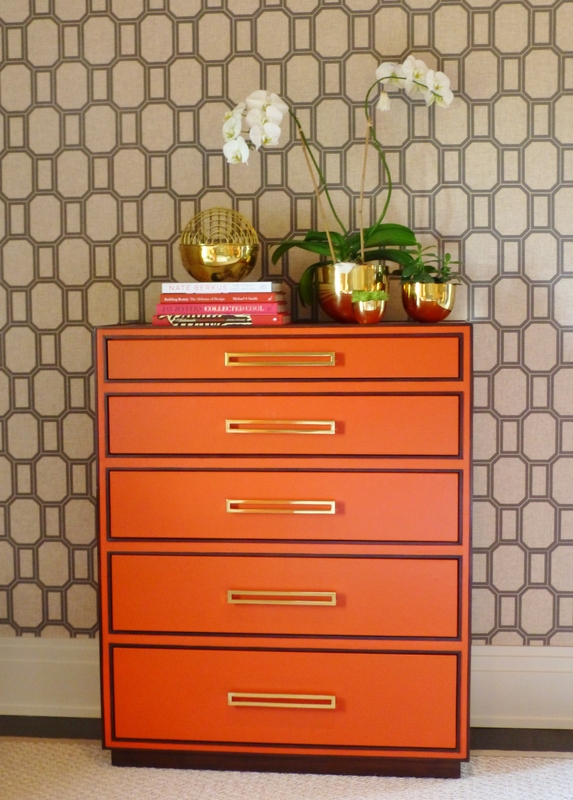 On the opposite side of the bed is this stunning orange chest of drawers. The color brings to mind the iconic Hermes branding. And don’t you just love the wide brass drawer pulls? They look amazing with the brass accessories atop the bureau, which have a funky 1970’s vibe. Before we turn around and look at the sitting area, check out the beautiful bench at the foot of the bed. It’s covered in an amazing grey and white faux-bois (wood grain) fabric. I just adore this! And the comfy orange throw just completes the look. Directly across from the foot of the bed is a lovely seating area and fireplace. There are even built in bookshelves at the right and a wet-bar at the left! 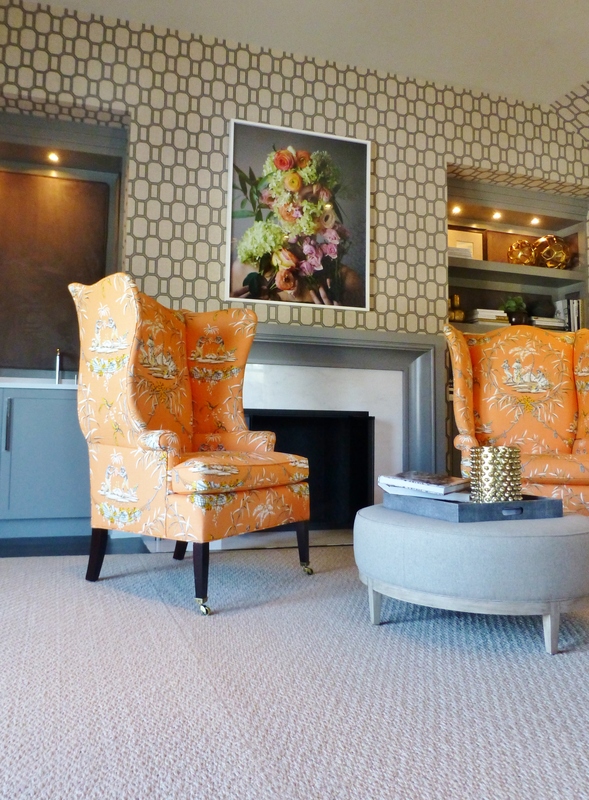 The curvy wing-back chairs are covered in the same orange toile, and a round grey ottoman is used as a cocktail (or coffee if you prefer) table. The colorful artwork above the mantel is truly amazing. At first glance it just looks like a photograph of flowers, but upon closer inspection, once notices an eye peeking out from the foliage and then naked shoulders with fingers clutching the bouquet at the bottom of the image. I love art that takes a few minutes to reveal itself! 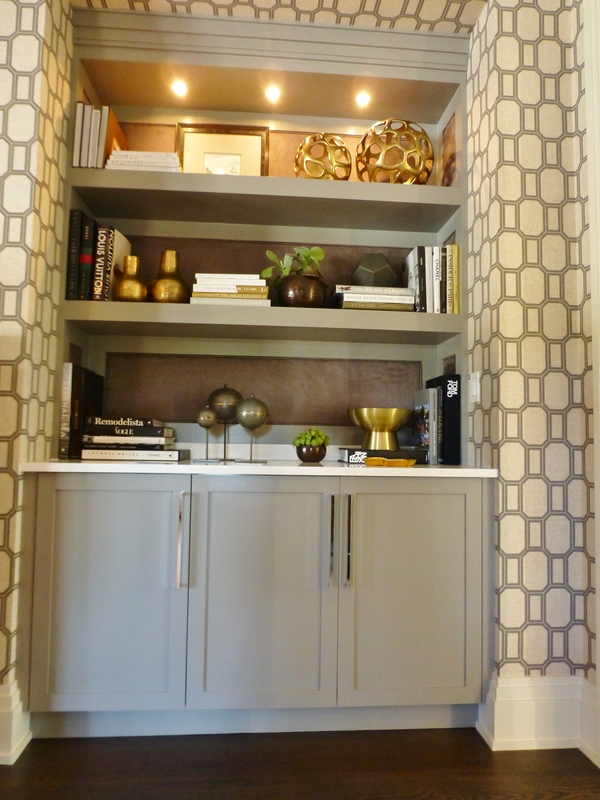 The bookcase accessories use limited color, and focus instead upon metallic with strong round shapes. To the left of the fireplace is a built-in wet bar complete with a mini fridge and everything one might need in a private master bedroom. How luxurious! 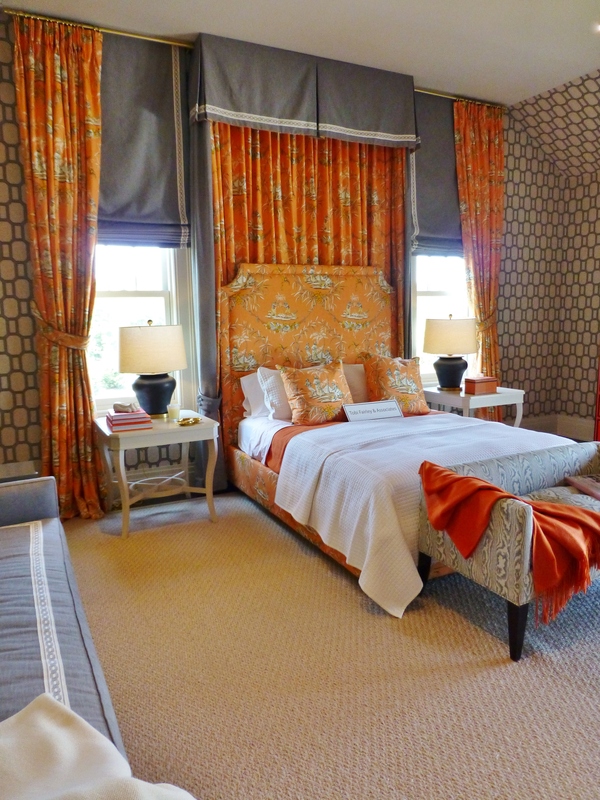 So, what did you think of this orange and grey master bedroom in the 2014 Hampton Designer Showhouse? I thought the grey was fabulous with the pops of orange throughout. 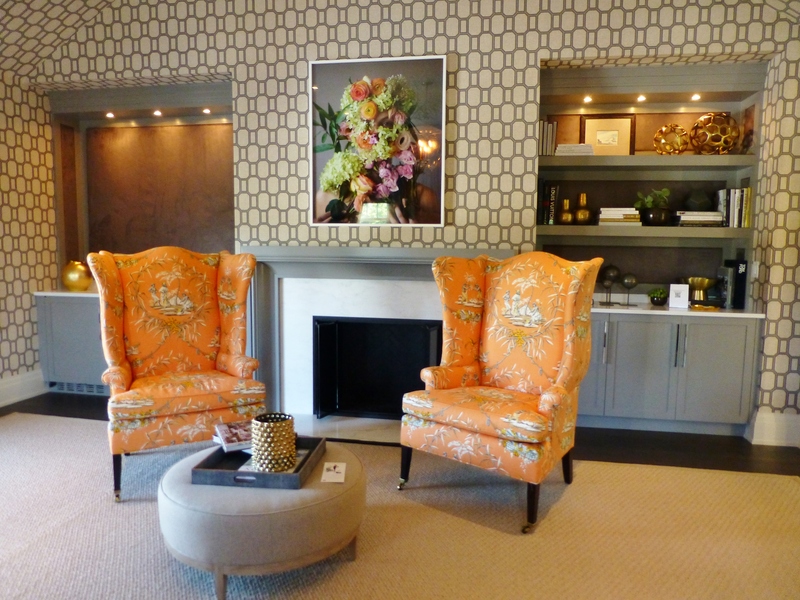 And I love that bold orange tropical Asian toile fabric! 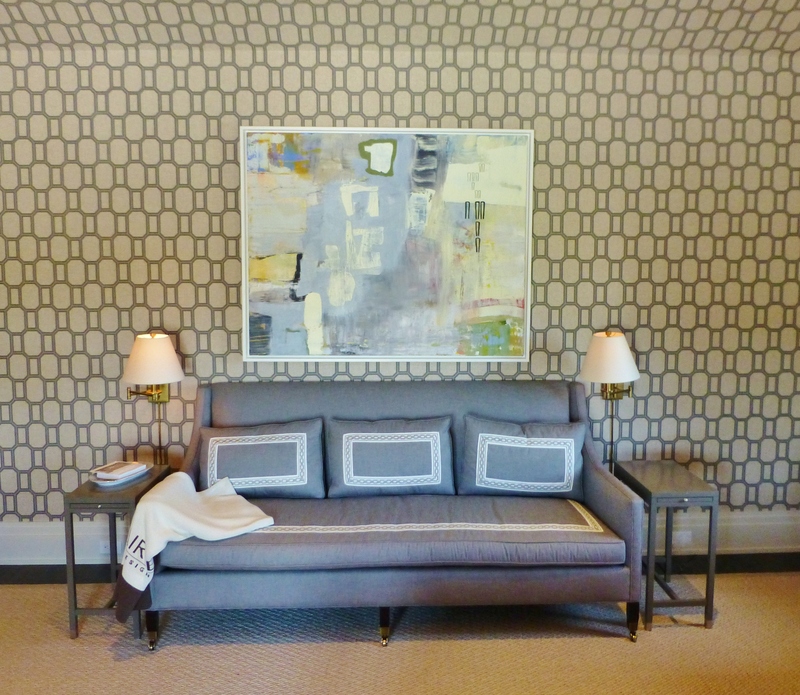 Tobi Fairley did an amazing job with her innovative approach to the design of this master bedroom. Until then, don’t forget to tell everyone you know about Kristine Robinson’s Interiors…I need all the friends I can get! 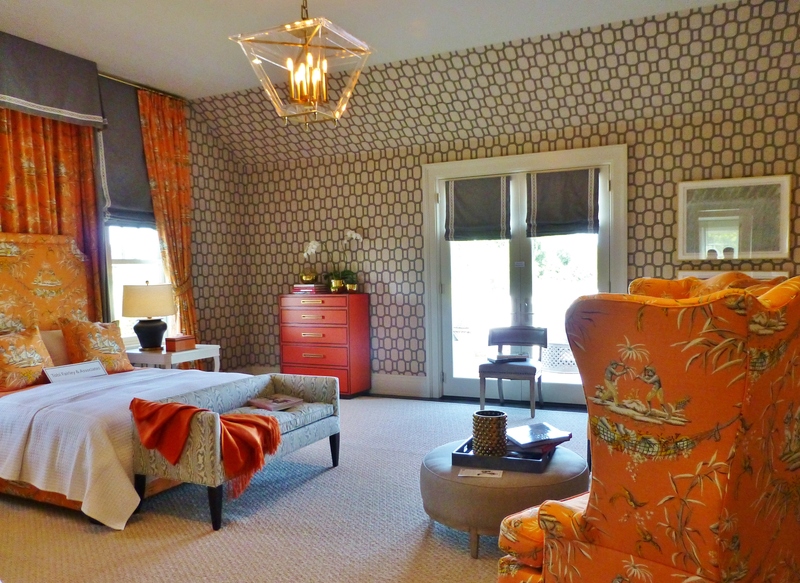 This entry was posted in Designer House, Interior Design & Decorating, Robinson Interiors, Tobi Fairley, Uncategorized and tagged 2014 Hampton Designer Showhouse, Bed Canopy, Gray, Grey, Half Tester, Lantern, Mansion, Master Bedroom, Orange, Orange and Grey, Wallpaper, Wingback Chairs. Bookmark the permalink.